Every child needs a Jellystone jChews Rainbow Stacker! 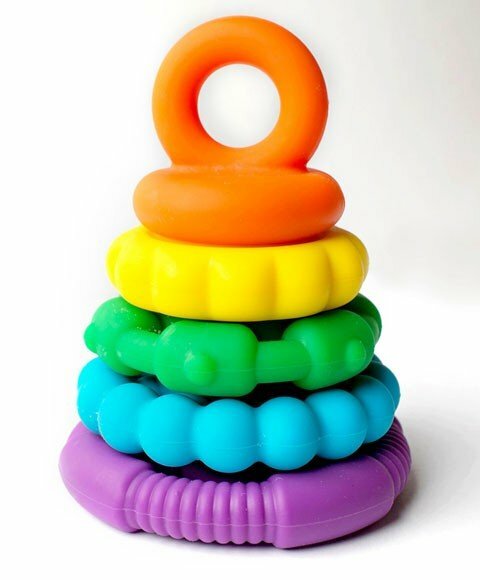 The Jellystone Jchews Rainbow Stacker in bright primary colours is a teether and toy combined. Multi purpose and suitable for all ages, it has a lovely feel in hand, and comes apart with a satisfying gentle pop. For babies it can be used as a teether and provides relief for tender gums. As your child gets older it can be used as a stacker toy to encourage hand eye co-ordination, creative thinking and problem solving skills. A fun and educational product that is safe, durable and quiet.